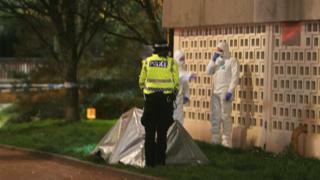 The body of a man who may have fallen from a flat window has been found outside a tower block in Glasgow. Police were called to Dundasvale Court in the Cowcaddens area of the city after the body was discovered at about 11:50 on Saturday. Officers sealed off the area, near Garscube Road, while a forensics team investigated. A spokeswoman for Police Scotland said: "One line of inquiry is that the man may have fallen from a flat window." She added: "A post-mortem examination will be carried out in due course and inquiries are ongoing."